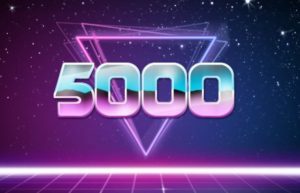 5000 Thank Yous | All Eighties Movies. All The Time! Six months later and as you’re reading this, so is the Cinematic Screen Tweeting Queen – and I know she’s as happy as I am – today we hit 5000 downloads! How did it happen? Because of all of you. On behalf of Gidgit, Colonel and myself, thank you so much for supporting our little podcast that for many of you is on the other side of the world. We just absolutely love these movies and the messages of support, thanks and “I’m going to show my kids this movie” absolutely makes our day. We don’t know all of you, but we do appreciate everytime you take the time to listen to us gush about another film that when we were kids, we were sitting in a cinema and just loving the film during that strange time that was the 1980’s. Great thing is we have NO plans of stopping and have hundreds of awesome 80’s movies we plan on podcasting and as Angry said – we only do the movies we really love and it’s so great you all love them too!!! Thanks for your support and words Emily – we hope they keep growing too, but its awesome having supporters like you enjoying the movies!